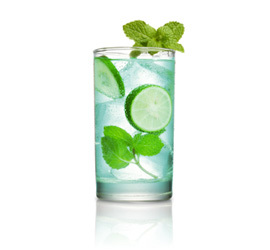 To bring out the herbal flavours of Hill’s Absinthe, try preparing your drink the Czech way. This method of making Absinthe with a flaming sugar cube is especially popular in the Hill family’s home country of the Czech Republic; Prague’s cafes are known worldwide for their flaming absinthes. Special note: Use extreme caution when using flames around alcohol. 1. 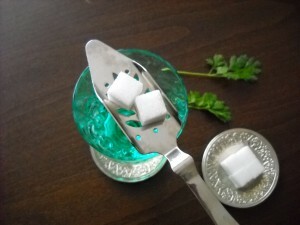 Place one or two sugar cubes on a perforated absinthe spoon, and rest the spoon on a glass. 2. Pour Hill’s Absinthe over the sugar cubes and into the glass. 3. Light the sugar cubes and let them burn until the sugar bubbles and caramelizes. 4. Finally, pour an equal amount of water over the cubes and into the Hill’s Absinthe.